Here are a couple of kids' t-shirts I dyed for my niece and nephew with Remazol type fiber reactive dyes. This has to be the worst way to photograph one's work: flash, little extra lighting, shirts just lying flat on a table - I'd have to do better if I were trying to sell these shirts! The flash kind of washes out that deep, rich black. These circles are really easy to do. I used two or three rubber bands for each of the small circles that I later dyed red. I made sure the rubber bands covered a circle plus the material gathered up in the point (center) of the circle. 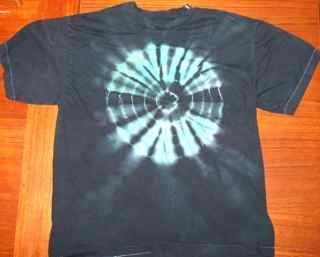 Scroll down to "Circles" toward the bottom of the page on ProChem's Folding Techniques for Tie Dye page to see their illustrations and instructions. The large circle I later dyed green was just a little more complicated. The way I like to do this is to fold a shirt in half, then draw the outline of a dinner plate on it, centered, so I have half of an 8" or 9" circle. Start pleating at the fold and follow the pencil line all the way around until you get to the fold again. Then tie at the circle, and arrange the pleats inside and outside of the circle before adding more ties to make concentric circles. 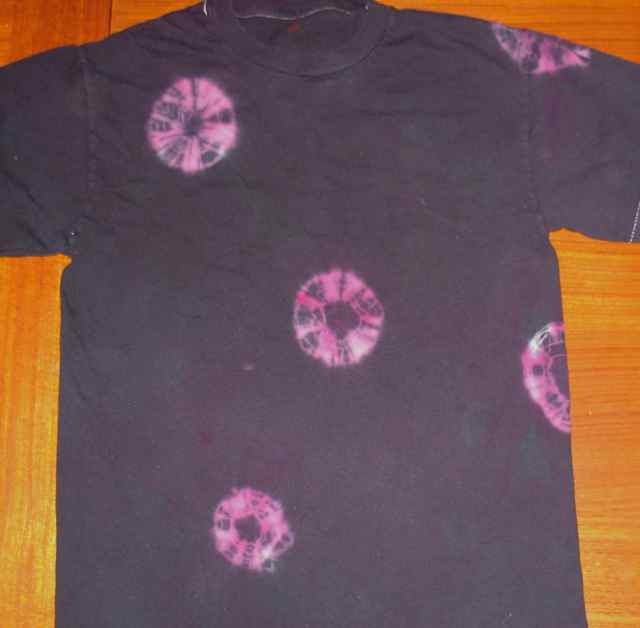 That's how I did these two circle shirts (as posted on the Dye Forum on March 23, 2007). For a really nice effect, use different colors on one side of your tied disk of fabric than on the other side. This makes alternating stripes of color, pointing out from the center of the circle. The material on this page originally appeared in postings on the Dye Forum on December 18, 2007.